The Aurora is another creation from our friends at http://velomobiles.ca/Aurora.html. It is one of the few designs that goes with the delta trike pattern( one front wheel, two rear). It is also the only one that seems to pull it off with an aerodynamic shape. 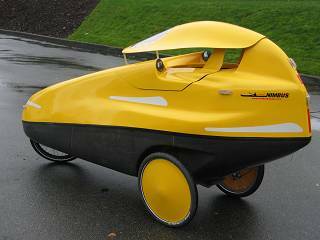 If you want something different(like a velomobile isn't different enough) this one is available for 7200 dollars Canadian with the roof option.